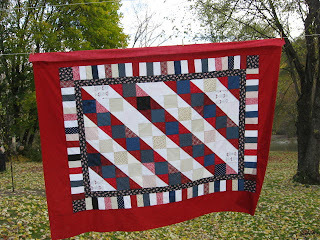 A couple of years ago Stitchinjoy organized an online sew-in one Saturday and I made this red, white and blue quilt. Last week this was one of three quilts I sent to be machine quilted. Has anyone else noticed the Pick Blueberries signs out. I have to get out there and pick some for a pie for SweetOldBob and for the freezer. We enjoy Banana Blueberry bread and muffins but my blueberries are all gone. I saw the sign out today when I went to my hairdresser. After all the scraps I used for the Nickel Brick and Scrappy Bargello quilts I still can count six baskets of small pieces of fabric. I bought more fabric a couple of weeks ago. The secret is out. I had Bob help me fold them when they came out of the dryer. He looked at my shelves of fabric about a year ago and innocently said "You aren't going to buy anymore until this is used up, are you?" With fingers crossed behind my back I replied "No dear." Today I am making two place mats for the auction at the Goodrich Reunion on Saturday. I'm using nearly the last of the Vintage Violet fabric I bought about five years ago. Most of it went into granddaughter Becki's shower quilt. I bet I can find enough left to make a couple of potholders too. And I know who likes lavender and purple in the Goodrich family. Wonder if she will bid and buy them? Today I took my Christmas Quilt made from the Disappearing 9 Patch pattern and cut on the diagonal to our Broome County Fair. Our guild had to promise to exhibit more quilts so we could use the frames Sue's brother made. I recognized a couple of quilts when I went there today. Looks like we can borrow the frames in October. Now to get the place mats finished (down to last border on second one), then the layering and quilting. Then I need to make a couple of those handy grocery bags Jane showed me how to do last year. I have some wild brown, red, gold and lime green huge flowered fabric that wants to go shopping. I think a subdued lime green for the handles would work.